I don't normally do link dumps, but since I'm behind on blogging and have been meaning to link to these things for a while… here are some articles for you to check out. The first set is on what storytelling means with data, the second about an interesting discovery around Charles Minard. What is Story? is the first posting and a bit of an introduction, with some definitions and initial thoughts. The Storytellers looks at the different people who are telling stories (with or without data): journalists, analysts, etc. On his policyviz podcast, Jon also devoted the month of March to storytelling, from episode 77 to 81, with episode 83 forming a bit of a coda. Even if you're not interested in the whole story thing, his podcast is well worth listening to. I have some thoughts on storytelling coming in some future postings, so the above list is a good warm-up. I also have two papers at EuroVis on the topic, which you will be able to read about here soon as well. RJ Andrews has written two great blog posts around an interesting discovery he made. It turns out that Charles Minard was considered so important that for a period of time, his work was included in official paintings of French ministers. Seeking Minard is a bit of background on Minard and his famous chart of Napoleon's Russian Campaign. Finding Minard describes RJ's efforts to chase down a painting that shows one of Minard's pieces in the background. 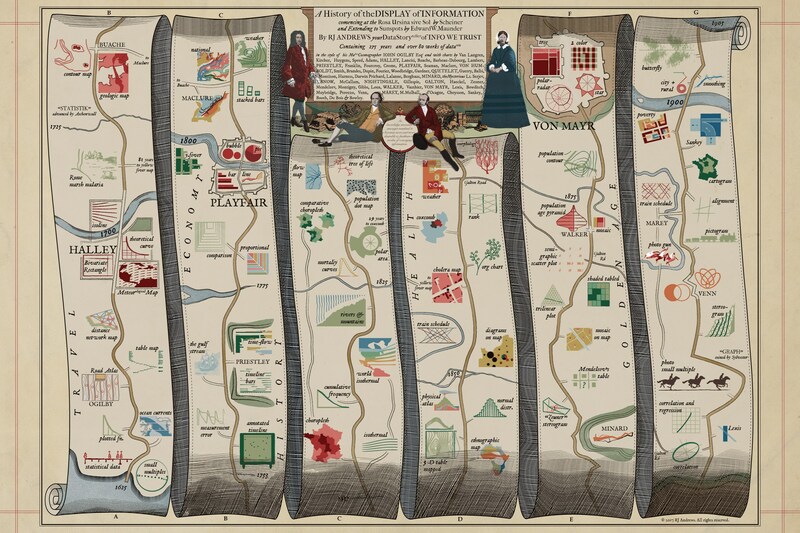 RJ has a whole series of posts about the pre-history of visualization, including a very nice poster with a timeline of some of the very early work.